From the heredity of Dharmavarma Cholan came a King called Nandha Cholan, ruling the Chola Dynasty with Woriyur as Capital. He was also an adorn devotee of Lord Ranganathar. He ruled his Dynasty in a prosperously and every citizen there was happy and the Dynasty was prosperous. Only the King has a problem that he doesn’t have child. Lord Vishnu asked Lordess Mahalakshmi to become the child of King Nandha Cholan. Once when King Nandha Cholan went for hunting he heard a child’s cry. He went in search of it and at last found a child on the lotus in a pond. He brought the child as his child and named her as Kamalavalli as She came come Lotus. When the Kamalavalli was grown up, She went to festival at Sri Rangam and admired the beauty of Lord Ranganathar and pledged to marry Him. Lord Ranganathar appeared in the dream of King Nandha Cholan and told him that his child is none but the Lordess Mahalakshmi so send her to Sri Rangam and Lord Ranganathar will marry Her. King Nandha Cholan was delighted that Lordess Mahalakshmi was his daughter and Lord Ranganathar is going to be his Son-in-law. He dressed Kamalavalli as bridegroom and took Her to Sri Rangam Ranganathar Temple. When Kamalavalli went near Lord Ranganathar, She vanished and Lord has accepted Her. King Nandha Cholan came to Woriyur and built a temple in memory of the marriage of Lord Ranganathar and her daughter Kamalavalli. 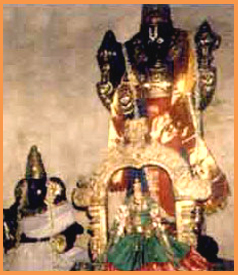 Lord Ranganathar here is called as Azhagiya Manavaalan. (Beautiful Bride). But this temple went inside the Earth when Lord Shiva opened His Third Eye and destroyed the entire Woriyur. After this the Chola Dynasty moved its capital to Gangaikonda Cholapuram. The present temple was later on built by an unknown king from the Chola Dynasty on knowing this instance. Architecture : The main deity here is Azhagiya Manavaalan is in the standing pose carrying conch and chakra in his hands. As Lordess Kamalavalli went to Sri Rangam and married the Lord Ranganathar, there is no separate prakaram for thayar Kamalavalli Nachiyar. She is here along with the Mulavar carrying the Lotus on Her hands in the sitting position as bridegroom. Kalyana uthsavam is celebrated on Panguni (March-April) Pooram day when Sri Rangam Ranganathar Temple utsavar will be brought here for the marriage (There is hence no Utsavar for the main deity here). Avathara Sthala of Tirupannazhwar for whom there is a spearate sannidhi. Direction and Posture Standing and North-faced. Access to the temple About a mile from Trichy and 3 miles from Srirangam. Bus facilities available in plenty. The Moolavar of this Sthalam is Azgia Manavala Perumal. He is found in Standing (Nindra) thirukkolm (position) facing his thirumugham towards North direction along with "Prayoga Chakkaram". Prakthyaksham for Ravidharman and all Devars. (330 crores). It is located inside the town Trichy. It is around 3 kms from the Trichy Station. The temple is located on the roadside. There are plenty of buses from Trichy Bus Stand to Woriyur via Nachiyar Koil.